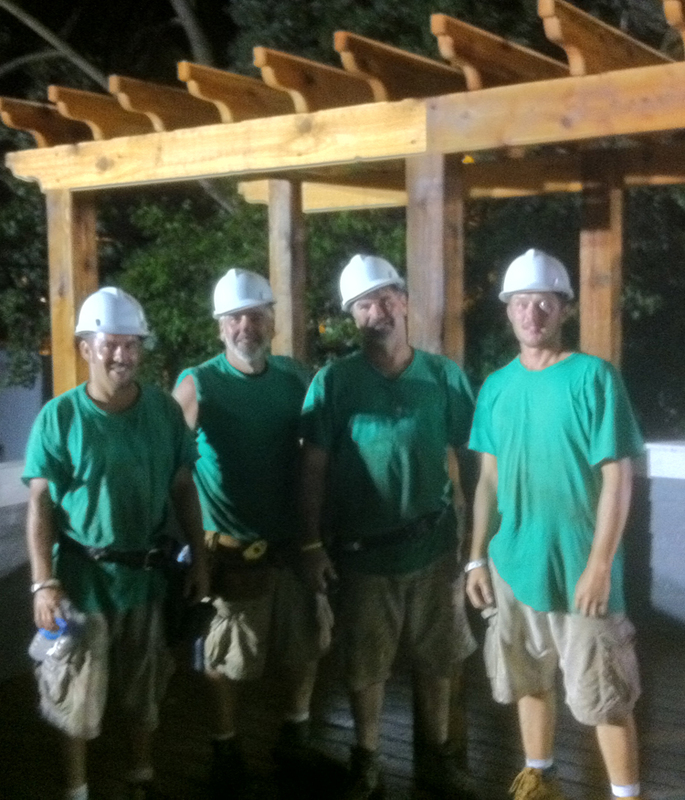 Here is a photo of the Archadeck of Columbus Extreme Home Makeover crew after 19 straight hours, still all smiles. Going into the renovation site, we really didn’t know what to expect. We brought our two best carpenters Seth Mitchell and Josh Kempf. Dennis Schaeffer from our corporate office flew in to work with us. With me that made 4 people on our Archadeck part of the Extreme Home Makeover team. We were scheduled to arrive at 6AM on Sunday. When we originally arrived we were asked to help with some interior framing. The framing guys had been working over 18 hours straight and were completely exhausted. We worked on interior framing for about 3 hours. It was amazing that there must have been 50 or 60 people in the house. There were hammers hamming, airguns shooting, nails dropping. There were people with drinks and food, producers, camera people, and about as much as you could possibly fit in that space. I guess it was apropos that we work effectively in such tight conditions as the Rhodes family had done at the house for so many years. Then it was on to the deck. Mr Rhodes’ existing deck consisted of a couple pieces of plywood on a couple of 2×4’s that sat on the ground. He had his grill sitting an top of the area. He loved his existing deck so it was important for the family and the producers to make a really great new deck. Because of space constraints, the deck was to be built on the garage roof. This meant that we had to protect the deck below with a rubberized roof. We laid the joists down and started decking just in time for it to rain. It rained. And it rained. And it rained. The over-garage deck had walls on 3 sides and a cedar pergola on the 4th wall. The entry and exit to the deck is exterior stairs. We built a landing and stairs all the way down to grade. We finished about 12:30 AM on Monday completely exhausted but also feeling really good. There’s something about giving back that can’t be described. But working with such a large team with so many cast members for such a good reason made 18 straight hours about as easy as it could be. The show aired as a 2-part series last Friday night. To see part 1, click here. To watch part 2, click here. Previous Previous post: How big should your Columbus screened porch be to accommodate your interior design plans?